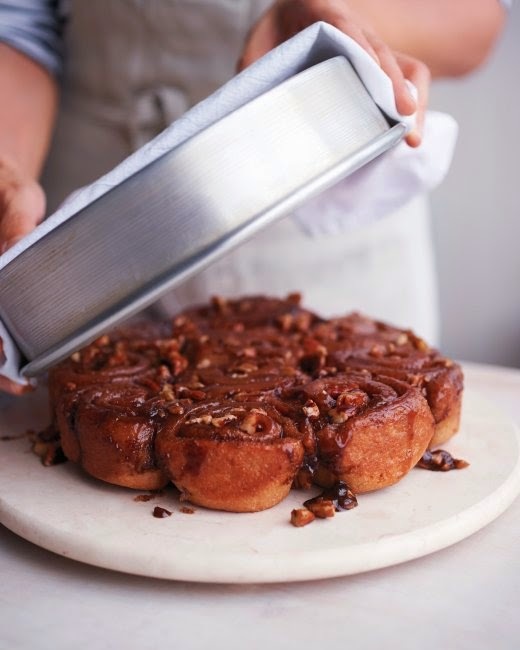 When I first saw these sticky buns in Martha Stewart, I made fun of them; I mean, you can maybe feel a little healthier about opting for a whole-wheat sticky bun versus one made completely with white flour, but at the end of the day, you're still eating a sticky bun. 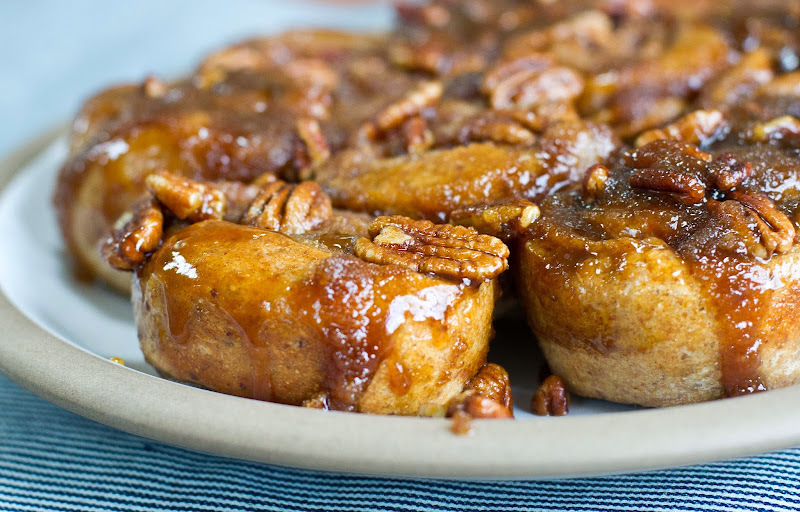 And yet, when I decided to have some pals (and their babies) over for brunch on Saturday, my brain was like: Remember those whole-wheat sticky buns? Those sure did look good! 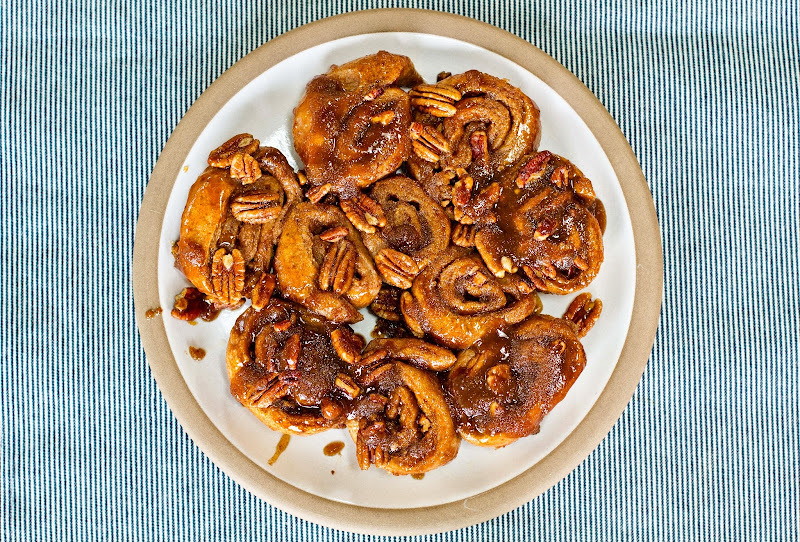 Still, I wasn't completely sold on them until I read a few other sticky bun recipes and decided that these "healthier" ones actually seemed like the least amount of work. Teddy's a little over three months now, and even though my mom was in town visiting for the week and helping out a ton (Thanks, Mom! ), a low work to high taste-reward ratio is still a major factor when choosing recipes these days. 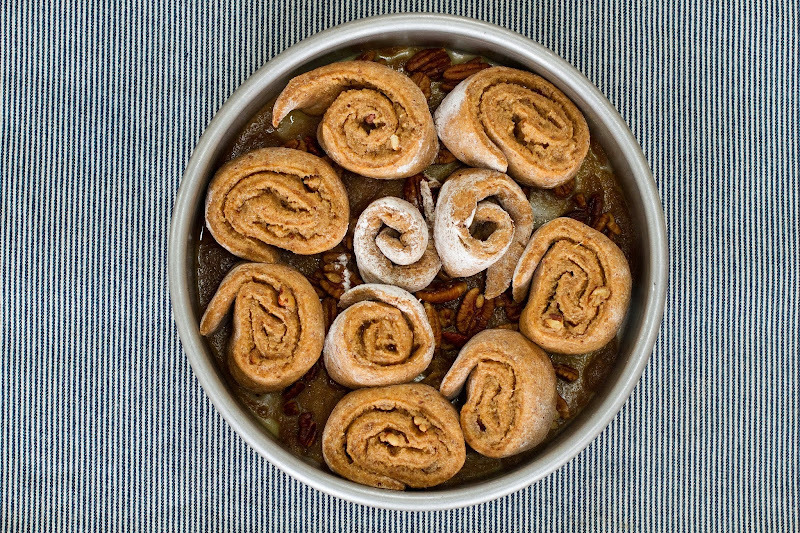 The only thing I didn't like about this recipe was that it didn't mention letting them do their final rise overnight in the refrigerator so that in the morning—when one typically eats a sticky bun—all you have to do is bring the dough to room temperature and bake it. But even without Martha's express permission, I took the overnight-rise approach anyway. 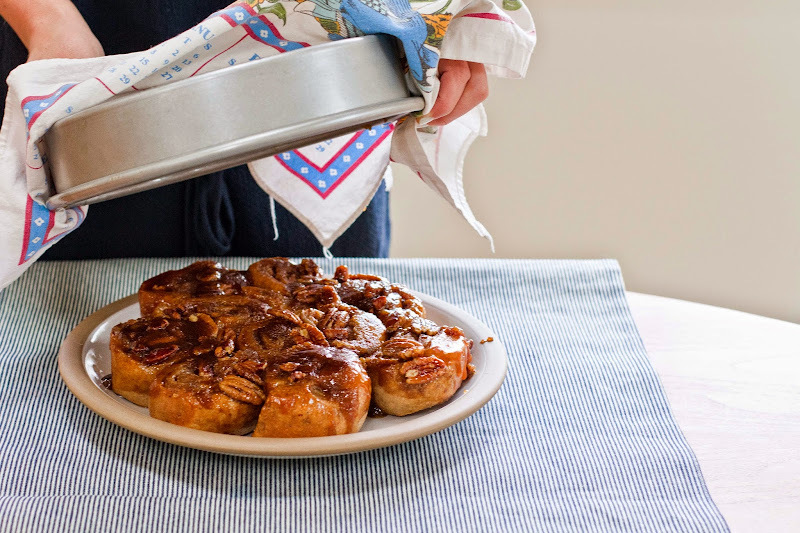 And well, while I really loved these sticky buns and would make them again, they were a little dense. My first thought was to blame the whole wheat flour. But perhaps they didn't rise properly overnight (though I know I've done this before with success). I don't think substituting ground flax seeds for the wheat germ did it, but maybe? Point being, the brunch was so much fun even if Teddy did have a minor meltdown at the beginning. And I know what you're thinking: What? No photo of Teddy to round out this post? Sorry! The good news is that Matt and I recently shot a bit of an epic video attempt for part of a super fun, network-wide collaboration for PBS Digital Studios that features Teddy in a big way. It won't run until early May (can't wait to share it with you! ), but in the mean time, if you need to see exactly what Teddy is up to (and who doesn't? ), go here! p.s. I am up to date with Game of Thrones and all I can say/ask is: WHO DID IT?! p.p.s. (Relatedly?) My friend Kate's book, American Afterlife, is out! Go ahead and get yourself a copy today! Lightly brush a medium bowl with butter; set aside. 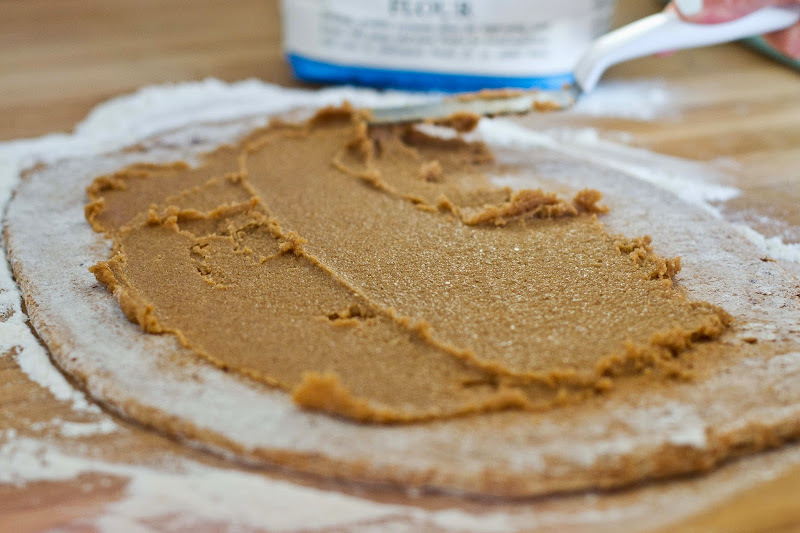 In the bowl of a stand mixer fitted with a dough attachment, combine flours, wheat germ, yeast, salt, brown sugar, water, egg, and butter. 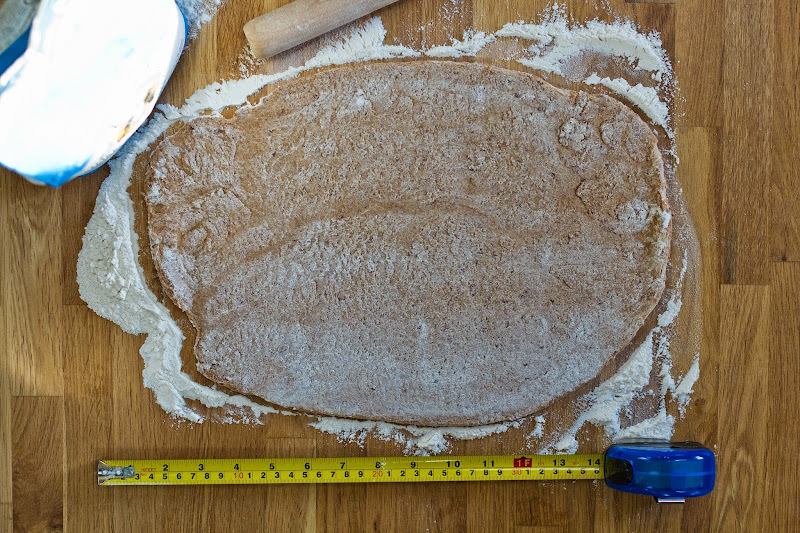 Mix on medium-low speed, scraping sides and bottom of bowl once, until dough is smooth and elastic, about 5 minutes. Transfer to bowl and cover tightly with plastic wrap. Let rise in a warm place until doubled in size, about 1 hour. 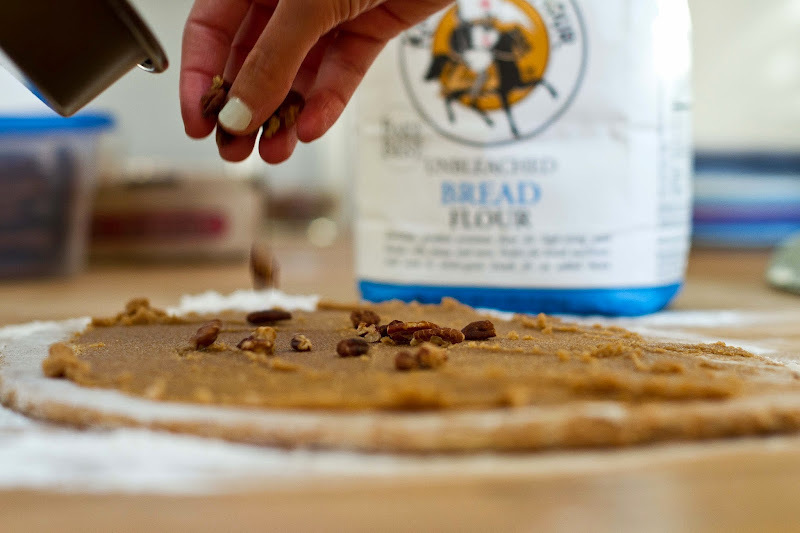 Brush a 9-inch round cake pan with butter; set aside. 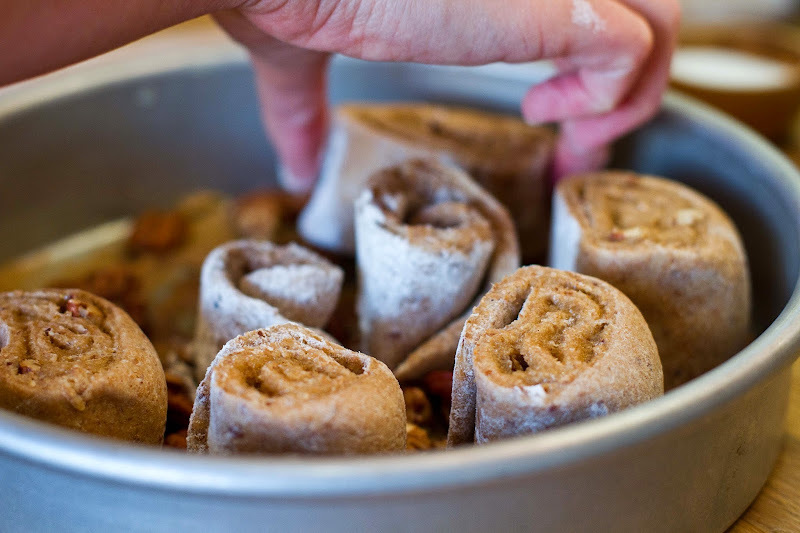 In a medium bowl, stir together butter, brown sugar, cinnamon, and salt until smooth and fluffy. 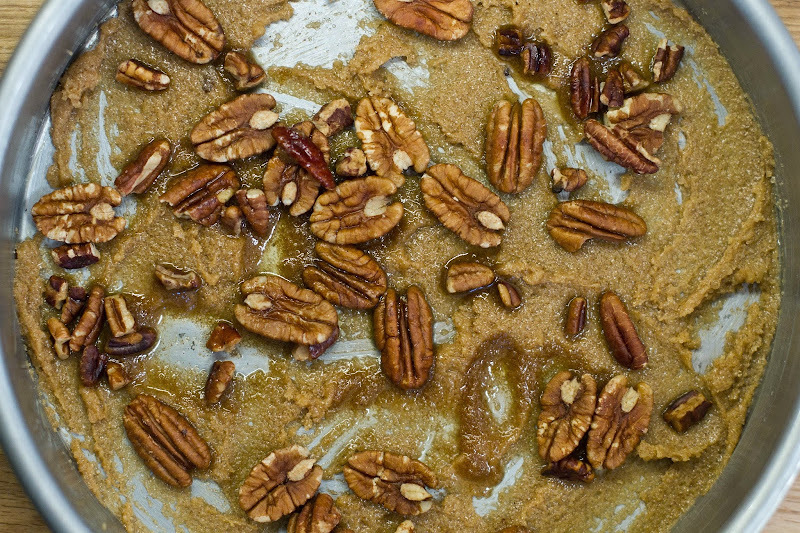 Spread half of mixture over bottom of pan; sprinkle with half of pecans. Preheat oven to 350 degrees. Bake buns until golden brown and topping is bubbling around sides of pan, about 25 minutes. Let cool in pan on a wire rack 15 minutes. 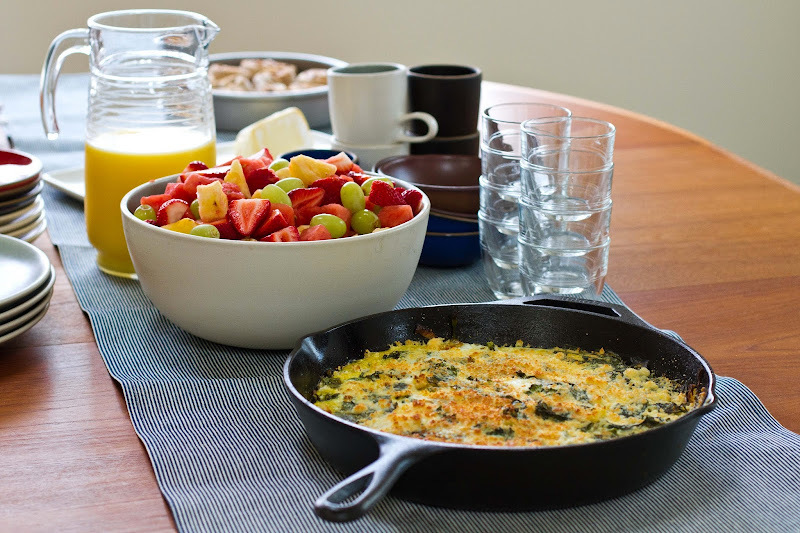 With a serving plate centered over pan, hold plate and pan together and carefully flip over. Lift off pan and scrape out any remaining topping onto buns. Serve immediately. I've had that happen that baked goods turn out a bit heavier when using whole wheat flour, but holy moly these still look RIDICULOUSLY delicious!! What a beautiful brunch spread! Way to go my dear! 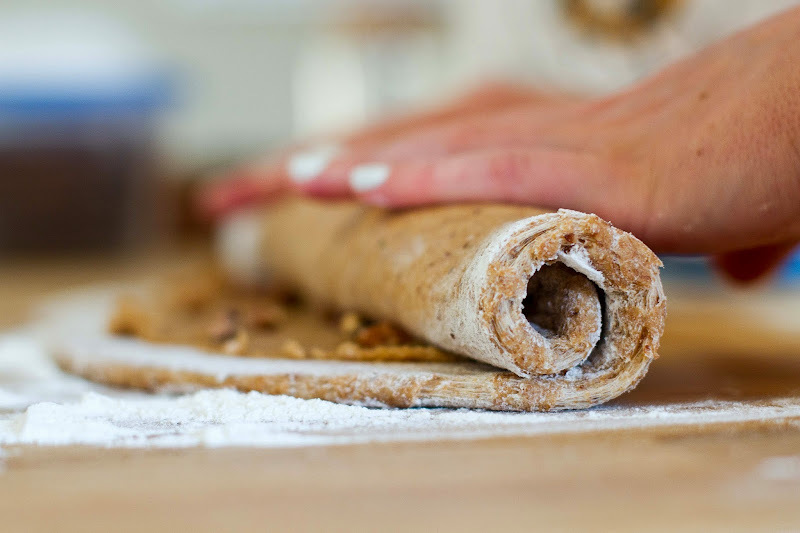 Those look amazing, As a fellow cook/baker, we all know that allowing the dough to work its magic over a longer time period works to our advantage. though with a whole wheat dough I don't know if it would make that much difference. Now, tell us about the egg dish you served!! This is really nice topic, which is very use full for me. I love that table top...inspiring me to invite some friends over! 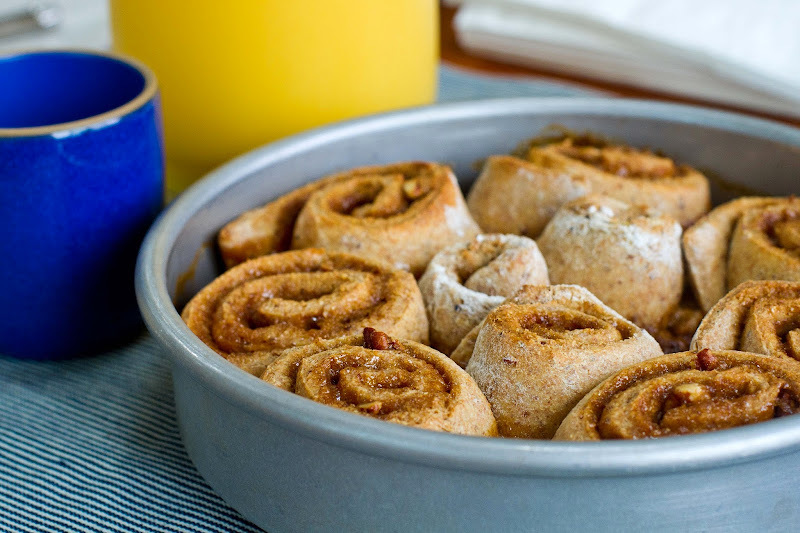 Also, I was perusing Pinterest (something that happens in fits and starts) and remembered to come over here after seeing David Lebovitz pinning your photo of your wheat buns!